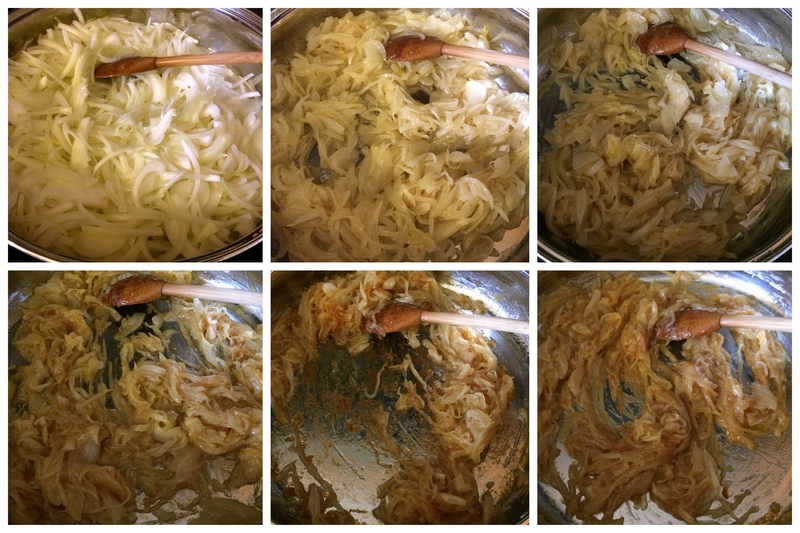 The truth of this recipe is…I just wanted to put caramelized onions on something. Anything. I think about them all the time. Some (normal) folks think about where to plan their summer vacation or what book they’d like to read next. Me? I daydream about crisp, robust onions cooked so slowly and softly that their internal sugars give up and melt down into a sweetened, intensely aromatic, amber-colored puddle of savory fascination. I might be in love with them. The problem is, I’m always wanting to make them but can’t seem to commit to the hour it takes to develop their insanely sweet-savory flavor combo. That’s some precious daylight, if you know what I mean. So, here’s the deal. Just do it. Make a double batch. They’re worth it. So, so worth it. 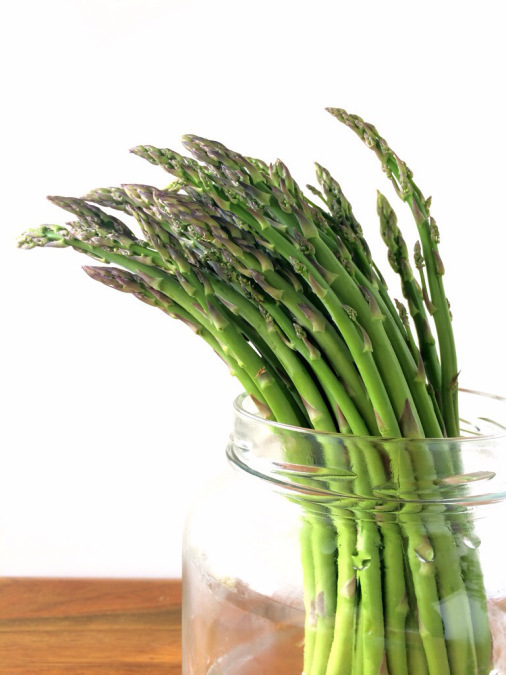 You can spread it like a jam onto sourdough, stir it into pasta, load it on a baked potato, or even mix it with cream cheese for a dip. But first, try it on pizza. 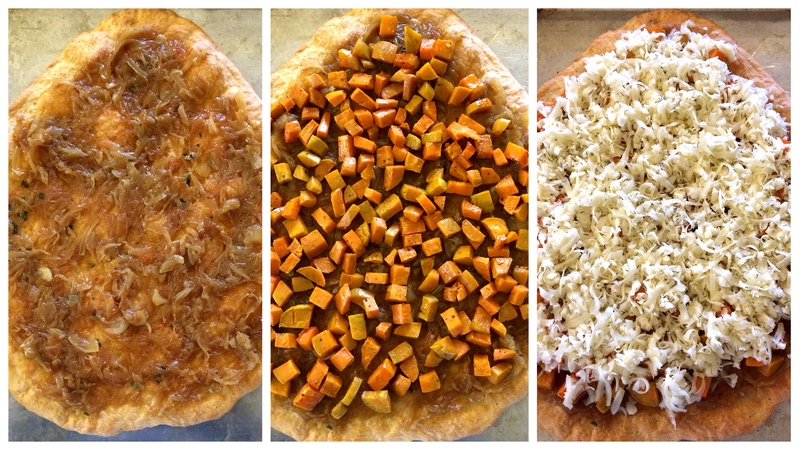 While the onions are doing their thing, you can roast the sweet potatoes, make the sage brown butter and get the dough ready. Then, it all comes together like one happy, cheesy family. And your house will smell like a dream. Two-ingredient pizza dough. Easy, breezy, beautiful. Heat butter and olive oil over medium-high heat in a large skillet or pan (I use stainless steel since it seems to help the browning process a bit). Add sliced onions and brown sugar to the pan and stir to coat in the butter/oil. Cook for a few minutes, until onions begin to soften, then reduce heat to medium-low. Cook, stirring occasionally, for 45 – 60 minutes, until onions are very soft and golden brown. Deglaze pan with wine, beer, or stock and Worcestershire sauce making sure to scrape up those yummy brown bits from the pan. Set aside. Preheat oven to 400 degrees. 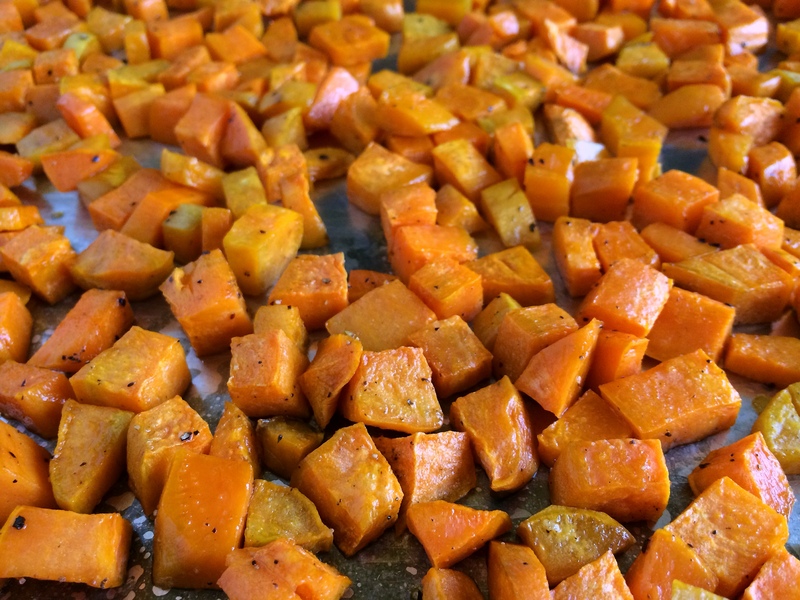 Toss sweet potatoes with oil and a couple good pinches of salt and pepper. 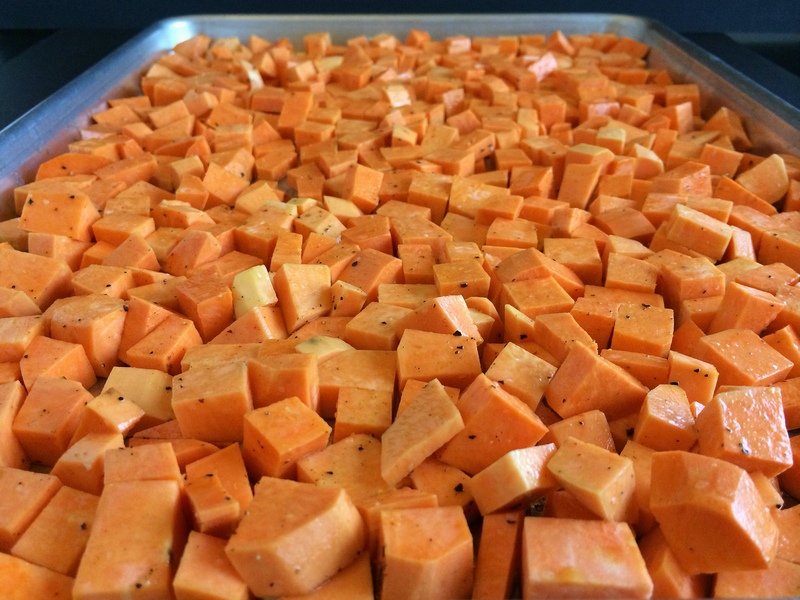 Spread out onto a large, rimmed baking sheet and roast for 30 – 35 minutes. Remove from oven and set aside. 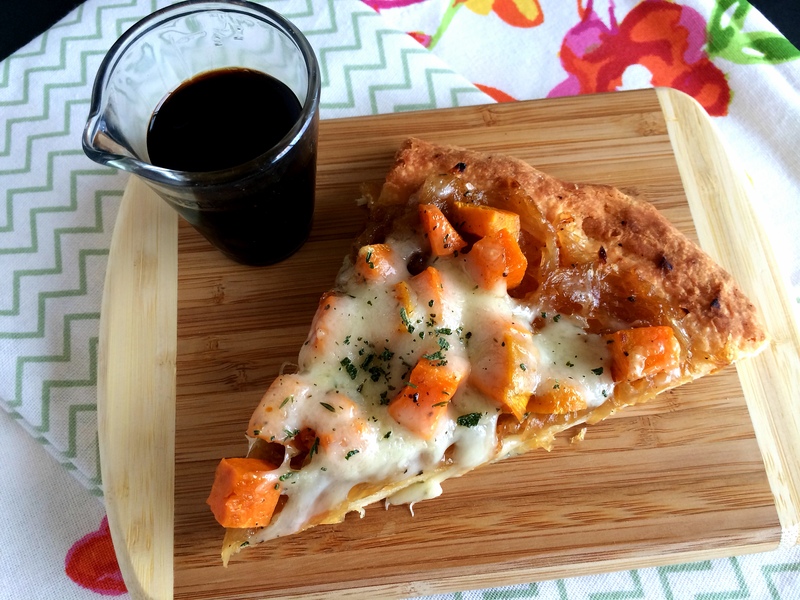 You may have left over sweet potatoes after topping pizza; they warm up great for a side or small lunch or toss them into a salad. Melt butter in a small saucepan over medium heat. Heat until golden brown, about 3 – 5 minutes; be sure to watch the butter, because it can go from brown to burnt quickly. Remove from heat and add sage, swirl pan to combine and set aside. *Tip: this sauce is amazing tossed with pasta, drizzled on cornbread, or spooned onto a baked sweet potato. Place the flour and yogurt in an electric mixer fitted with the dough hook. Blend on medium-low speed for 5 – 7 minutes, adding more flour until it pulls away from the sides of the bowl. Turn dough out onto a well-floured surface and knead for a minute or two, using additional flour until it’s no longer sticky and can be rolled out. Preheat oven to 450 degrees and heat a pizza stone for 30 minutes. 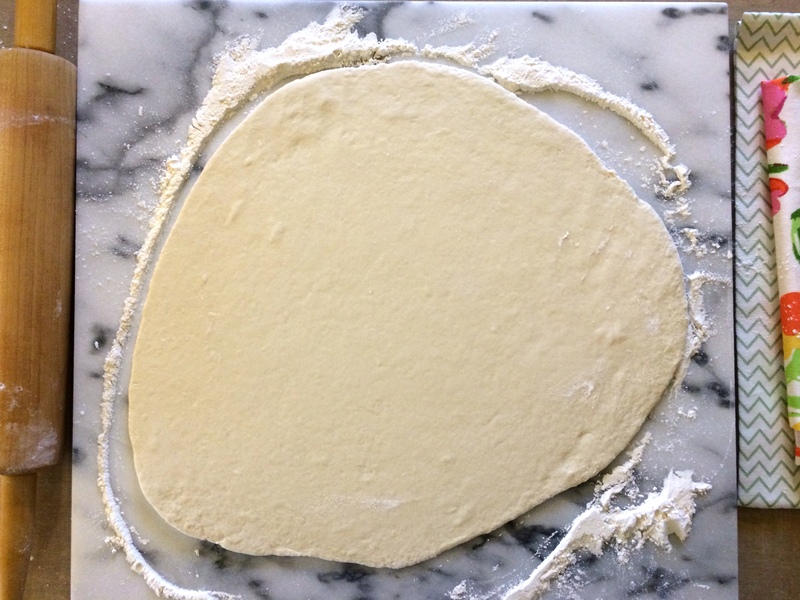 Roll dough out to a large oval and transfer to the preheated pizza stone or an oiled baking pan. Brush dough with the sage brown butter and bake for 8 minutes, until golden brown and slightly risen. 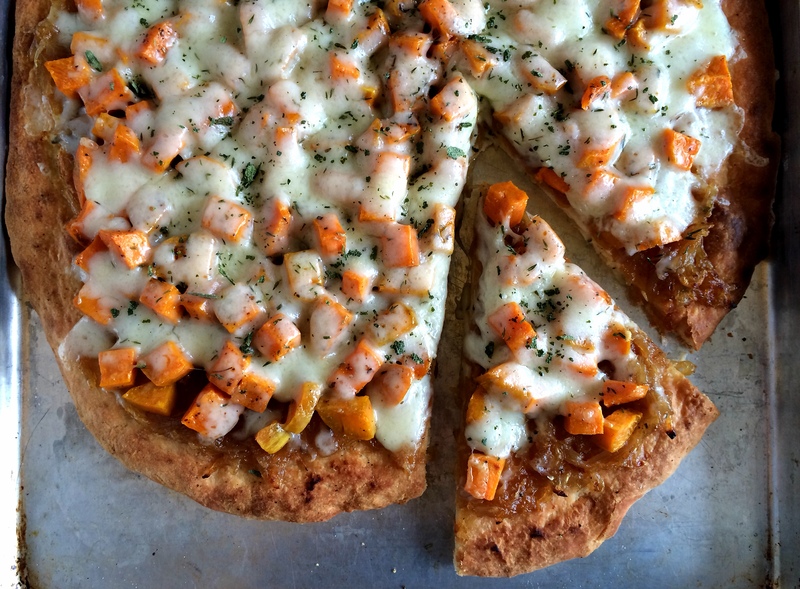 Remove from oven and spread dough with caramelized onions; top with sweet potatoes, cracked black pepper, and shredded cheese; and sprinkle with dried thyme and sage leaves. Place under broiler until cheese is melted. 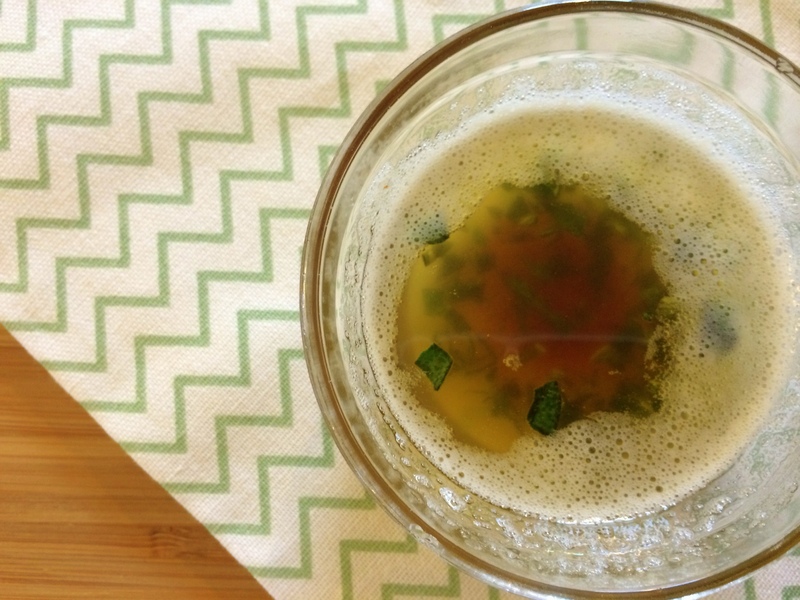 Garnish with more dried sage leaves and serve with balsamic syrup. You could also serve the leftover sage brown butter for dipping the pizza crust in! Enjoy! I love love love carmelized onions! We stopped at a falafel joint while on our road trip cause I was craving them. This pizza looks awesome! We make the cabbage carrot almost weekly…we’re going to have to mix it up with this one. I hope you try it, I think you’ll love it! Post a comment if you do, or if you vary it up share what you did!! Thanks!